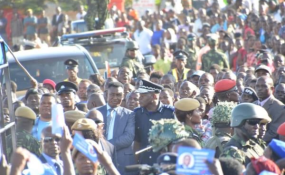 Home / General / Malawi: Dare To Record Videos of Mutharika’s Speeches? Malawi: Dare To Record Videos of Mutharika’s Speeches? Part of the President Peter Mutharika's campaign audience in Mchinji. One person (name withheld) from Kapiri posted: "Zinali kuno kwathu Kukapiri ku Mchinji... kunabwera Peter (Mutharika) koma atifufutitsa zonse tinajambula pa stop tour yao." (This is what happened, here, at Kapiri in Mchinji... Peter (Mutharika) was here but they forced us to delete whatever we recorded on our phones regarding his whistle stop visit). From Mchinji Boma, another person (name withheld) said this on his Whatsapp group: "Kuno Ku mchinji amaletsa kujambula komanso munthu ali ndi phone amamutsitsa pomwe anakwela" (Here, at Mchinji Boma, they (DPP cadets and Police) they were stopping people from recording and whoever was perched on higher ground with a phone was pulled down).